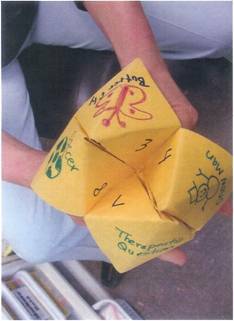 Dr. Zelinger has adapted the popular Chinese Fortune Teller as a cognitive behavioral technique to help children explore alternate behaviors when confronted with issues that continue to be problematic. It can be used by play therapists, parents, and teachers. The following article is reprinted from the New York Association of Play Therapy Newsletter (May 2008, Volume 12, # 2), with appreciation to the NYAPT. I have developed a therapeutic use for the paper fortune tellers that we used to make when we were kids. My clients enjoy the arts and crafts element of creating their own project while the fortune teller lends itself as a cognitive behavioral approach to dealing with a child’s personal struggle. The fortune teller is a carefully and somewhat intricately folded piece of paper, which when opened, reveals two levels of concealed surfaces that contain written information. The child can use this technique alone, with a second person or even in a small group. I first used this technique with a young girl with selective mutism who would only use her voice on occasion in the classroom. The question asked of the fortune teller was, “What are the different ways that I can communicate in school?” During the session, I helped my client figure out the various ways people can make their thoughts, feelings and wishes known. I gave her a piece of paper with lines numbered from 1-8 and through discussion, she generated eight ideas. These ideas were then written onto the eight innermost layer of the fortune teller. In its closed state, the fortune teller has four outer diamond shaped surfaces, which may be decorated in any fashion. One of the four surfaces is reserved as the surface on which the therapeutic question is to be written. Children enjoy decorating these with familiar symbols (i.e. hearts, flowers, foods, superheroes, words). The only requirement is that each of the three be different from one another. The holder of the ZFT asks the other person to choose one of the three sides. When the choice is selected, the ZFT spells out that symbol, moving the ZFT back and forth for each letter. 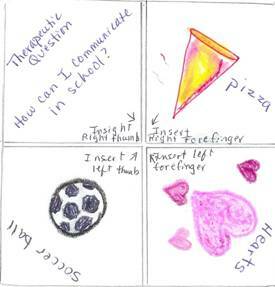 For example, if a child selects the picture of pizza, the ZFT moves five times spelling out each letter P-I-Z-Z-A. If superman had been selected, the ZFT would move eight times. It is best to choose pictures that when spelled, have a different amount of letters, in order for different surfaces to be revealed. When this first sequence is completed, the ZFT will be in a position revealing four previously concealed (in)sides, which now reveal a number that is written on them. When the caller makes another choice, the ZFT maneuvers back and forth to coincide with the number selected, thereby completing the second sequence in this game. The ZFT will now be in an open position revealing those same numbers again. The caller chooses another number and the folded paper is now lifted in the final stage, to reveal the hidden message beneath. The ZFT holder first reads the therapeutic question written on the outer most (undecorated surface), followed by the message inside that is now disclosed because the paper has been lifted to reads the words underneath. I have also used this technique with other children, more recently with a child whose therapeutic question was, “What can I do when I get mad at my sister?” There are many ways to adapt the ZFT depending upon the child’s age, interest and inner resources. Younger children may need larger and stronger paper on which to draw and write. I have used construction paper with them, and they have put all 4 fingers of each hand into the ZFT (like a mitten). Young children should use fewer choices, probably four rather than eight. To avoid needing to spell, they might sing a song and maneuver the flaps back and forth until the song is over. Older children may adapt the second sequence to include higher numbers than merely those one through eight, choosing for example, 28 or 61 maneuvers. 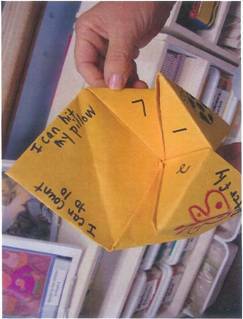 Children should be encouraged to individualize their fortune tellers, based on their issues, interests and abilities. The work of the therapist is to help the child develop their own list of positive alternative responses to add to their behavioral repertoire, and to help create a project that is unique and fun for them to use over and over again. Begin with a square piece of paper. If you use traditional typing paper, hold it vertically and cut off 2-½ inches across the bottom and you will be left with a square. Save the leftover piece of paper to make your list on later. Fold two opposite corners toward the center until they meet in the middle. Repeat with the two remaining opposite corners, until all four corners meet, and the outside paper now forms a square. Keep these papers folded in place, and now flip the paper onto its reverse side. Again, take each (thick) corner, and fold in over until each point meets in the center of the square, forming four mini triangles (each divided in two parts) in the process, with a total of eight sections. Write a number (1-8) on each of those sections. Lift each of those four mini triangles, to see where you will be writing the affirmative messages on the under side of the paper. If you write small, you can get eight messages in, one under each number. If not, write only four. Decorate the outside 3 surfaces, and leave one of the squares available to write the therapeutic question. Use that 2-½ piece of left over paper to write the list of eight alternatives behaviors. Then transfer them to the under side of the paper described in Step 6. Now, your Zelinger Fortune Telling-er is complete.